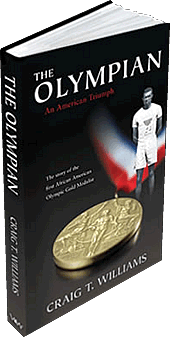 The Story of the First African American Gold Medalist The Olympian by Craig T. Williams. Available on Amazon.com! Our book signing and launch event for The Olympian: An American Triumph by Craig T Williams in Philadelphia last week was an affair not to be missed! We had an amazing turnout from friends, family, supporters and new fans of the novel. We began the evening in the African-American Museum where Craig lead an inspirational discussion and signed copies of They Olympian: An American Triumph to Philadelphia guests which included a group of young, track athletes. This was the first author meet-and-greet and book signing for most of the track team and it was a treat to be their first exposure to such an activity and tell share John Taylor Baxter’s story with them. We had a good time with our new readers and look forward to their feedback on the novel. After the book signing, we headed over a few blocks to the former Union Bank of Philadelphia Building where it was time to celebrate! It has been an incredible journey bringing The Olympian: An American Triumph to life and we have many friends and family members that we wanted to share our joy with. Our guests included some of Philadelphia most celebrated artists, business people, and politicians. The event was accented with special contributions including: art by Jules Arthur whose work was inspired by the novel; piano performance on by Elew; spinnin’ courtesy of ?uestlove; and libation provided by Grey Goose vodka. Needless to say, we had an incredible evening.